Preserve the memory of the past! Making a Life History Video captures your images and stories forever. Do you ever wish you could have a video of your great-grandmother or grandfather talking about his/her experiences and share all those unique family stories in one organized place? By making a Life History Video, you can preserve your stories for all of the generations to come. These videos, enhanced with vintage family pictures, create a personal documentary that records an oral and visual history of your family tree that is priceless. How many of us know more than a few generations of our family history? What were your ancestors doing in the year 1800… or the year 1066… or the year 476… or in 1400 BC? Wouldn’t that interest you? What we offer is a chance for you to explain to your children, grandchildren and all subsequent generations, your beliefs values and unique family heritage. It’s important for all of us to hear and know about our past and to find our place within our family tree. Let your family take a genealogical journey through your eyes so that every family member can have a better understanding of who and where they come from. Imagine it’s the year 2050… or 2150. Future generations will marvel at how well documented your LIFE HISTORY is, if you have the foresight to do it now. Our most treasured memories are those of our family. Every family has extraordinary moments and even ordinary moments that are special to you. A child is born, grows up, becomes an adult. It all happens so fast! There is time, though, to capture those memories and preserve them for generations. With our help you can preserve all those stories by letting us make a personal biography of your life. For example, we will record you talking about the day your children were born and your earliest memories of their childhood or film your Mother telling you how she met and fell in love with your Father. Treasured memories that would otherwise be lost. Capture the spirit of the people you love and the special events of your life. Video enables the viewer to see and feel the spirit and vitality of a person or moment. Grandparents can preserve an oral/visual history by recounting stories from their life’s experience. Hopes and goals for the family can be explained in your own words. Faith and philosophy can be shared. Knowledge, dreams and aspirations can be passed on through your advice and wisdom. Imagine being able to listen to your great grandmother’s voice, and see her smile, as she sings or talks about her life. and hear your Grandpa laugh as he recalls stories from the “Good ol’ days”. Now you can! Keep all of those priceless memories organized in a personal video library that we help you create. The following video was made for a married couple who are some of the nicest people I have ever met. I got a chance to film a surprise 90th Birthday celebration for a truly inspiring man. He served in World War II, was shot down twice in a B-24, awarded the Flying Cross and a Purple Heart among other citations as he helped liberate Europe in 1944-45. After his military years he went on to become a Emmy Award winning Producer for NBC and a successful CEO. This gentleman has had a very fascinating life and continues to live it to the fullest with his lovely wife. This video shows a glimpse of his life and how some people of his generation should be honored and given our respect for living a memorable life. We can learn a lot from their virtuous example. What was once only available to Hollywood studios, is now available to you at an affordable price! You can expect high quality, professional looking final products. Home movies don’t have to be choppy and unprofessional anymore! Everyone has pictures. These pictures build up over the years. Videos, pictures and slides get buried in a computer folder or a box to gather dust in a closet. Now you can bring them back to life in a coherent manner by organizing them into Family History Video Library. We can help you use those cherished vintage pictures to create a vivid documentary of your family. We will consolidate everything you have accumulated over the years, from old VHS tapes & 8/16 mm film reels to slides & pictures with a personal interview with you, to create a personal biography of your life. Wouldn’t that mean a lot to you? 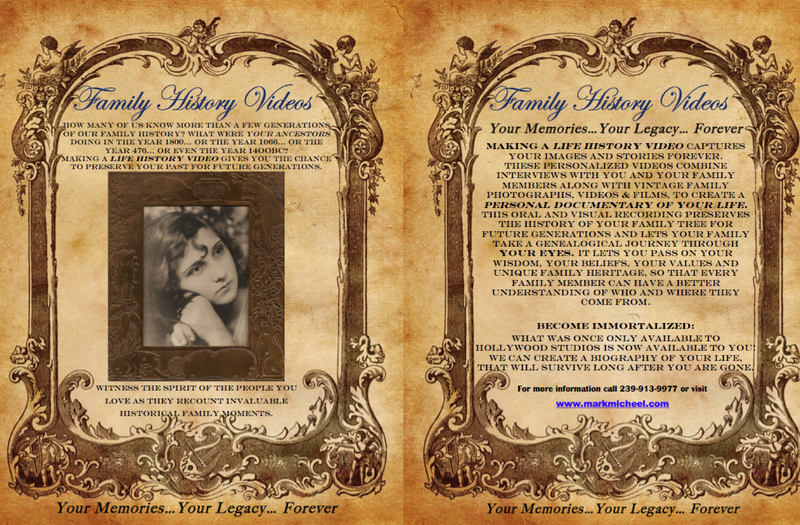 Family History Videos- Estimates are given after a free consultation. Each story is unique and may take more or less time to create. These videos on average can be done within a few days. Pre-Production consists of a meeting(s) to discuss themes, gather information (pictures, videos/films, memorabilia) and determine chronology of events. A full family history can include multiple interviews with family members and may require travel. Call 239-913-9977 today to request an estimate. Below are a few more examples of the Family Life History videos. In the following video, I captured my Mother singing, reciting french from a play that she acted in when she was a theatre student and discussing her passion for poetry. You can sense her excitement as she talks about her love of art. A precious recording of a graceful soul. Before my Mother passed away, I recorded her while she told stories of when her Father took her to the opera at the age of six, her recollections of her Mother, her love of life (joie de vivre) and her personal philosophy. An irreplaceable recording that captures her lovely spirit.